After three releases in the vein of DSBM/Atmospheric Black metal, Panopticon, the brainchild of Austin Lunn, rose to prominent attention with 2012’s Kentucky. 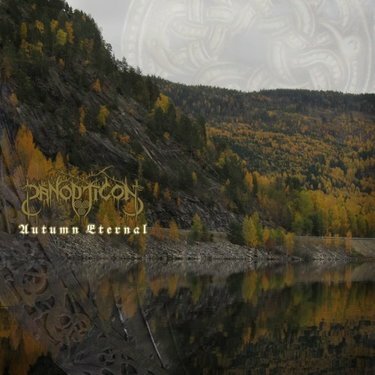 For what may have been the first time in black metal, Panopticon incorporated the use of traditional folk music from the southern United States, including banjo, steel string guitar and fiddle. The unconventional approach worked for some, and others disregarded as a gimmick, but Kentucky was widely regarded as a high achievement in American black metal, and the term ‘Appalachian Black Metal’ was used to distinguish the music’s influences from its northern Cascadian cousins. Last year, Lunn released Roads to the North, which kept the southern folk influences, but incorporated them more subtly into the music, in some cases using the instruments without the obvious accompanying song structure, such as in Norwegian Nights. Other tracks dabbled in influences outside the immediate scope of atmospheric black metal, such as the melodic death metal influences on Echoes of a Dissonant Evensong. All this preamble leads to this year’s Autumn Eternal, released barely a year after the last record. Opening with acoustic instrumental Tamarack’s Gold Returns, the obvious influences return, with violin, steel guitar slides and acoustic guitar set to a backdrop of running water. But by the time Into the North Woods opens, those influences will not be heard from again; at least not in such an obvious manner. The first thing I noticed is how fantastic the production of this album is. Superficially heavy on the bottom end, the metal tracks open with a thunderous wall of sound, yet every note of the tremolo guitar leads and harmonies is clearly audible, the bass comes through with the occasional satisfying twang and crunch, and the vocals are perfectly placed as another instrument, never overpowering the true lead of the guitar melodies. I was instantly reminded of this year’s release by Sivyj Yar, in that instantly memorable and melodic guitar motifs frame the song in a clear and accessible way, without ever resorting to being obnoxiously catchy. However, I feel that Panopticon achieves this with a large degree more black metal bite than Burial Shrouds did. Into the North Woods closes with a militaristic snare drum roll against some organ-esque synths, and I can’t decide if it’s creatively intriguing or utterly out of place for the more natural tone of the album. Regardless, the album continues on much the same way with the title track Autumn Eternal, and Lund continues to impress with well-crafted guitar leads and creative drum patterns and fills which stop the music from ever becoming repetitive. However, I must return to a previous point. The southern folk influences for which Panopticon have become known for are conspicuously absent for all but the opening instrumental of the album. That isn’t to say that the band has released an album without any sense of dynamics. The midpoint of Oaks Ablaze gives way to an ambient section with engaging drum rolls, and the following track fulfills its titular promise as Sleep to the Sound of Waves Crashing features an interlude of ocean ambience and violin overlays, and ending with some unusual compositional tradeoffs between the violin and metal. And the back-end of Pale Ghosts is a startlingly unexpected foray into a post-rock, drone-rock section which would seem more appropriate on a record by Mogwai, or even The Cure. This record should silence the critics who have previously regarded Panopticon as little more than an average atmoblack band with a gimmick. The gimmick has all but been removed from the music, leaving in its place several examples of spectacular songwriting, riff crafting and compositional diversity. The sonic variety previously provided by the southern folk and Appalachian influences has been partially replaced by post-rock, ambience, some drone and clean passages. One must ask if it is an improvement. It should certainly hush those who accused Lund of resting on his unique influences, but for those of us who cherished the banjo and fiddle interludes are left with an album which may not stand out from the vast, homogenous genre as much as before. Lund has certainly proven here that he has the songwriting expertise to make Panopticon a leader in the genre regardless, but I doubt that this album will be remembered as a particularly unique example of the genre.